Ladder toss outdoor game, two pvc game sets with 6 bolas with carrying case for kids and adults by hey! play!the ladder toss outdoor game, two pcv game sets with 6 bolas with carrying case for kids and adults by hey! play! is a great outdoor game for the beach, backyard, tailgate, family reunion or backyard party for players of all ages. Important: avoid buying counterfeit products and transacting with unauthorized sellers. Look for our logo on the packaging for every one of our products. Hey! play!mitted to providing the consumer with the absolute best price and value on our entire line of products, which we ensure by applying a rigorous quality control process. Easy and fun to use with full layout base for stability - the ladder toss outdoor game is easy and fun to use. It sets up in minutes with easy-to-piece together pvc plastic pipes, and differs from other sets by having a full layout shape for the base for stability, to prevent it from easily tipping over. Convenient carrying case- this isplete ladder toss set, including a handy carrying case that allows you to easily fit all pieces, so that you can readily take this to your next outdoor activity. Ultimate outdoor yard game - kids and adults of all ages and skill levels can participate in ladder golf, making it the ultimate outdoor yard game. The fun doesn' t stop there - ladder toss games are an ideal game for back yard, front lawn, beach, tailgating, and parties. 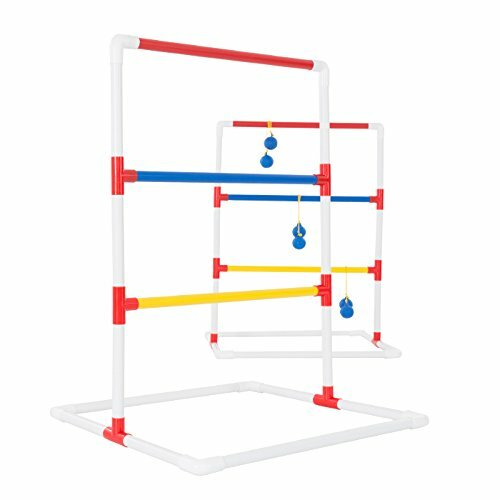 Product details - 2 ladder targets measuring 30" high x 22" long x 22.75" wide with an 6 golf-ball style bolas, 3 blue and 3 red, and a zip-up carrying case. Satisfaction guaranteed - hey! play!mitted to providing consumers with the absolute best price and value on our entire line of products. Note: this is an exclusive product of hey! play! and only outdoor games by hey! play! are guaranteed to be genuine.